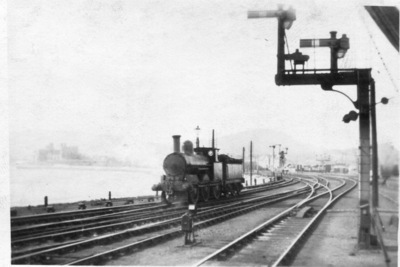 No idea of date but location looks like the view east from the east end of Llandudno Junction station. The odd shapes to the left are I think Conway Castle. I'm sure John is correct; the location is Llandudno Junction with Conway Castle in the left distance, but looking west. I think the nearer tracks lead to the carriage shed (behind the camera) with the 'Cauliflower' pointing towards the engine shed. The engine doesn't seem to have a numberplate, but as it still has its LNW lamp-sockets the date is probably in in the 1920s. The wheel on the smokebox door handle, and the absence of any visible U/Q signals, might also suggest pre-war LMS days. Harry is of course correct - I had my directions completely reversed and should have said west. John has nailed it. If you go to: Britain from above And enter: WAW023359 in the search box there is a 1949 image. If you have an account (easy, worthwhile and a cost free exercise ) you are able to zoom in and then the signals can be paired off between the images. The sea bay to the left in 197 has been reclaimed and in-filled and virtually eliminates the curve of the bay which threw me on Google earth. There are what I take to be two pilots at the platform end - back to back on separate roads- just behind the bunker of the right hand loco is an unbalanced two doll bracket signal which is fairly rare and I think is the clincher. The signal cabin can just be discerned in the gap between the right hand signal post and what I can only think is a tie bar to try and check droop on the arm.